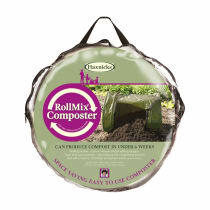 Home composting has never been easier, quicker or more fun than with the RollMix Composter! Simply add your household and garden organic waste and follow the simple how-to instructions included on the reverse of the pack. The polyethylene fabric traps heat, and by adding water and rolling, it is possible to make your own compost within 6 weeks. With your rich, nutritious compost you can top up raised beds, add to the base of plants and even use as a peat-free potting compost.